The weekend has come to a close and all have safely made it back to Auburn. The overall assessment was very positive, with Scouts agreeing that it was a great experience. As we checked out of the motel, the management had high praise for the conduct of our Scouts and said they would be willing to have us return any time. Of course, it should be noted that in contrast to some of the other youth groups staying in the same motel, our Scouts seemed almost angelic! Following a good breakfast at the local Flapjack House, the troop loaded up the cars and headed down the road to Pigeon Forge. The final entertainment for the trip was the opportunity to race at one of the many go-cart tracks. Scouts (and a few leaders, siblings, and parents) made high speed turns around three different tracks. Liam best summed up the go-cart experience using words such as "awesome" and "great." Creighton tops the crest of the upper track. As we left Pigeon Forge, it seemed that every person in the area was attempting to leave at the same time. The result was an hour's journey for the few miles out to I-40. However, once on the Interstate, it was smooth sailing for home. Even Atlanta traffic seemed tame in contrast to Pigeon Forge and Sevierville. With a lunch stop in Athens, TN, the last of the vehicles pulled into the church parking lot around 5:30 PM local time. Liam, Ethan, Jason, and Joe enjoy lunch at Subway. 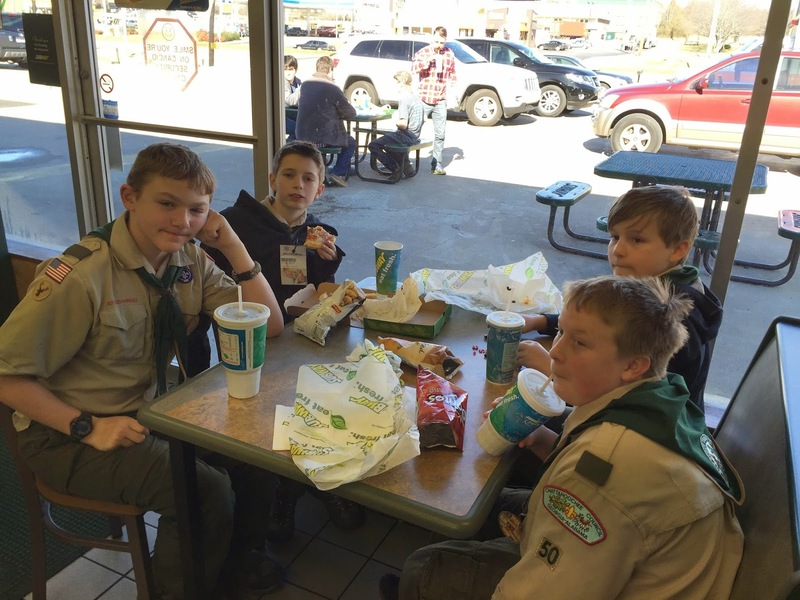 Although a campout critique will be conducted as part of the next troop meeting, several of the Scouts expressed their thoughts about the favorite elements of the trip. 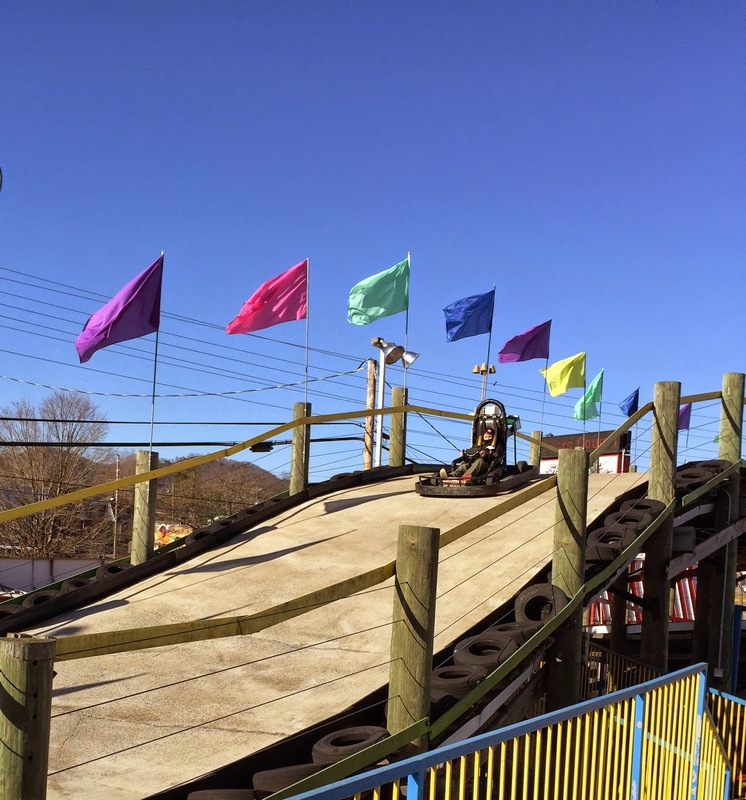 Although the go-carts and scenic chairlift were enjoyable, the overwhelming favorite activity was the skiing. Aiden said that he "enjoyed learning to ski," even though he didn't spend a long time doing it. Ethan noted that, "it was great hanging out with friends and having fun in the snow." Creighton observed that "no one quit skiing" but instead gave it their best shot. He also said that "skiing with friends was the best part" of the trip. Josh flatly stated that "skiing is [his] new favorite sport!" Rusty loved the trip because he, "discovered that skiing is something that [he] can do well." The assistant senior patrol leader, Will, offered the opinion that the newer Scouts and the veteran Scouts had "bonded through fellowship" as a result of the shared experience. The final word came from Andrew as senior patrol leader. He commented that the trip was "good overall and a good learning experience for the younger Scouts to try something new." The troop certainly met the challenge and had a great time in the process. For more photos, check out the online photo gallery.